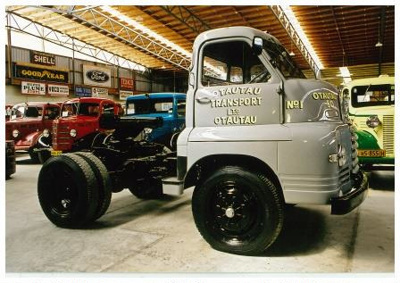 This 1952 Bedford SAG is fitted with a Scammell automatic trailer coupling which was fitted by Scammell Lorries Ltd and is the same as the 6 Ton version of the Scammell Scarab. Note the very short 86 inches wheelbase. There were several of these units sold in Southland. This truck was bought new by the Otautau-Invercargill Freight Service. It ended up as a hay truck in the Te Anau area, then Southland Truck Wreckers bought it. Bill Richardson bought it from them in 1988.